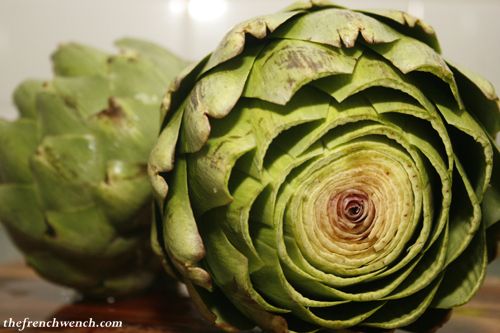 … then the top off the artichokes. 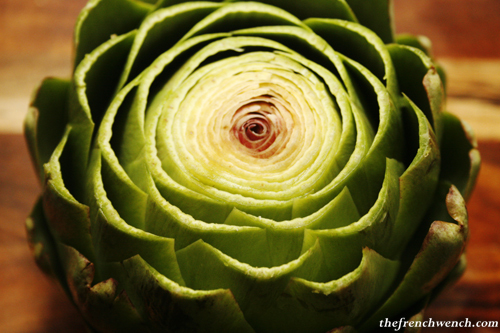 The artichoke is ready for boiling. After cooking the artichokes for about 30 minutes in boiling water, in which one lemon cut into quarters was added to avoid the artichokes to darken, I drained them as much as possible and place them directly in the plate. 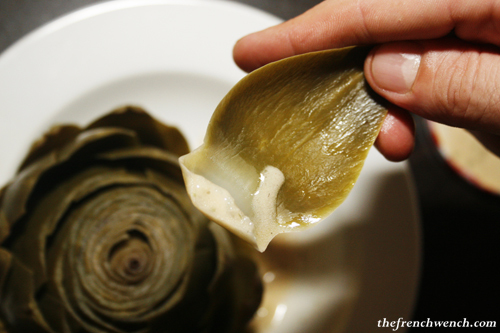 I eat my way through the artichoke from the outside, scraping the leaves through my teeth one by one after dipping them into a vinaigrette composed of: salt, pepper, a spoonful of Dijon mustard, chopped parsley, red wine vinegar, a bit of mayonnaise or cream and grapeseed oil. There is really only the white-ish bit of the leaf that is worth eating, the rest is inedible. After a while I reach a point where there is really not much left to eat off the tiny leaves. 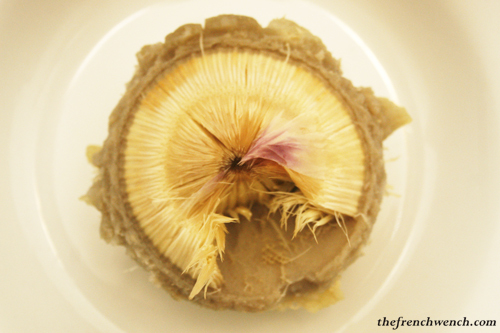 I peel them off, then the kind of hairy fibres that are covering the artichoke heart. 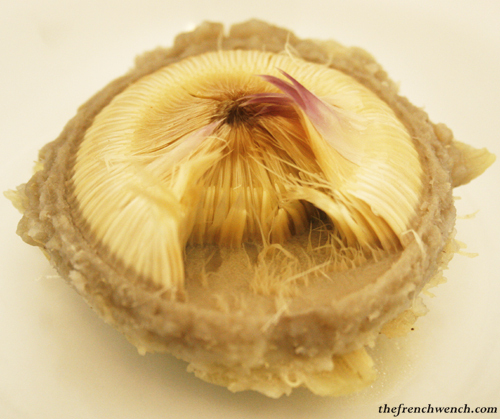 I finally uncover the heart, considered the best bit of the artichoke, and cut it into bits which I also dip into the vinaigrette… it’s crunchy and delicious! 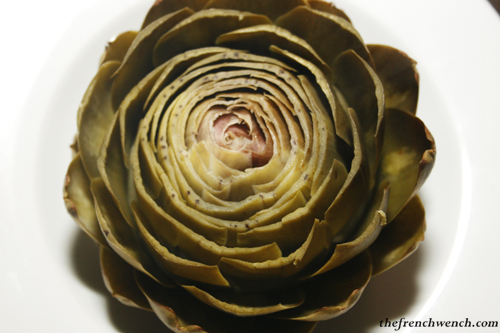 This entry was posted in Recipes, Uncategorised and tagged Artichoke Heart, Artichokes, Food, In season, Recipe. Bookmark the permalink. Yummy! Incidentally I really like the stalk when the bud is young. Like eating asparagus only sweeter. 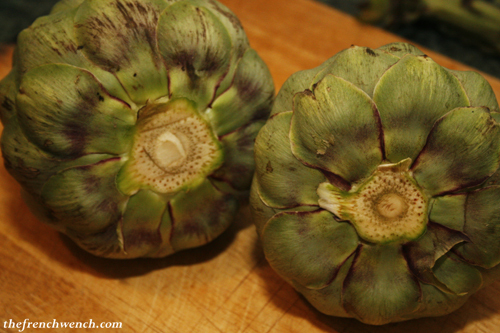 I love my artichokes simply done as well. Mum always use to make them and serve them as you have but on occasion also served them with some breadcrumbs browned in lots of butter. Evil and not an every day food, but oh so good. 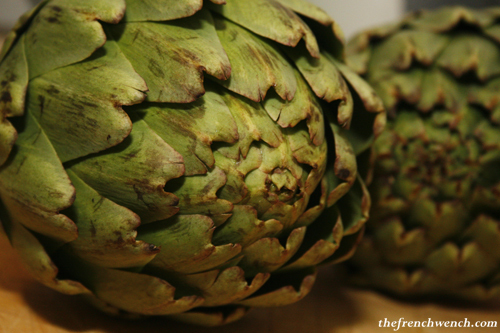 Not long back from a week near Toulouse and with some of the biggest artichokes I’ve ever eaten. 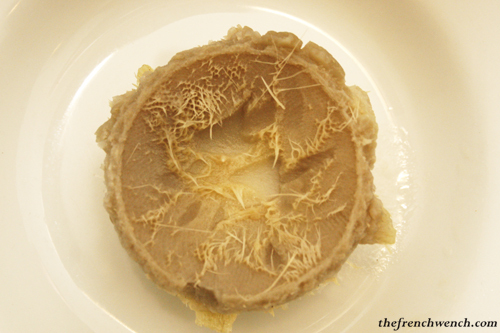 I like them simply with good quality salted butter and cracked white pepper.